Carluke and Clydesdale residents and councillors are right to be concerned about the plans for a waste incinerator near Blackwood (‘Fears that incinerator could pollute Clydesdale’, Carluke Gazette 22nd June 2010). The positive gloss usually put on waste incinerators by governments and companies is that they are burning waste to produce “green energy” and “recycling waste” , but incinerators create CO2 emissions and climate change, particularly from hydrocarbon or oil based plastics (1). The other pollution created by waste incineration is even worse. Dioxins produced by the incineration of plastics and other materials are carcinogens (i.e cause cancer). Particulates and acid gases can cause or worsen breathing problems. Both can be spread over large areas by the wind as ash or gas polluting air, water and land and ingested by humans either directly, by breathing them in, or from drinking water or eating food polluted by them. Ash may also contain toxic heavy metals (2) – (6). While the amounts of these pollutants have been reduced in newer incinerators there is no guarantee that they have been reduced to a safe level and there is no consensus among scientists about what level of exposure to carcinogens such as dioxins is safe. The level of pollutants created would also surely be affected by what kind of waste was being incinerated (2) – (6). We certainly have a worldwide problem in how to deal with rubbish, but the best solution would be start with strict government regulation of the types and amounts of packaging allowed for different products, especially food and drink packaging, which accounts for the majority of household waste. This would minimise the amount of rubbish which would have to go to landfill, incinerators or to be recycled and could help ensure that packaging in future would not be made of materials which would create dioxins or other toxic pollutants when recycled. The Global Alliance for Incinerator Alternatives suggests producers should be made to pay for the disposal of their products and packaging, to give them a profit motive to use less toxic and more easily recyclable materials (7). George Osborne claims welfare spending had to be cut because it has “ballooned” and this is presumably his justification for cutting housing benefit, despite the fact that homelessness charities such as Shelter Scotland say this will increase homelessness. Welfare spending has certainly increased over the years, but so has spending on everything else, because the economy has over-all grown a great deal over the decades and there’s also been inflation. The website ukpublicspending.co.uk has compiled tables based on figures released by the government from 2009 on, covering the entire period from 1950 to the present. These show annual public spending, annual GDP (the output of the economy) and how much was spent on each area of public spending. Welfare spending as a proportion of public spending fell from 20% in 1997 to 15% by from 2005 to 2009. Compared to the 1970s and 1980s it’s actually fallen significantly from levels of 20 to 30% of annual government spending.Since there has been a recession since the 2008 credit crisis the fact that welfare spending didn't increase in 2009 suggests that, if anything, people made unemployed by the recession are not getting the benefits they need, further depressing demand in the economy and hampering a recovery. The government’s budget is supposed to be about spreading the cost of cuts fairly, according to ability to bear them. That makes it hard to understand why housing benefit should be capped. There is certainly waste in the housing benefit budget, but that has been created by Conservative and New Labour governments’ selling off of council housing without building or buying nearly as much new public housing. This has resulted, in a significant minority of cases, to the government paying large amounts out to private landlords, which is the fault of government, not of people who can’t afford to buy or rent their own housing. It could be solved by a mixture of buying and building more council housing and regulating private sector rent levels, rather than capping housing benefit and throwing people onto the street as a result. Are large scale public sector job cuts necessary and are they wise? That’s apart from the fact that public sector job cuts on this scale aren’t necessary and aren't wise. What determines the future of government revenues is mostly the performance of the economy, not whether the government is in debt. While it’s not advisable for governments to take on debts that don’t help the economy or prevent severe poverty or suffering for large numbers of people, they can operate with considerable levels of debt. (Look at the US for instance, with decades of a bloated and ever increasing defence budget leading to a vast national debt). As many economists (and Labour MPs) have warned, sacking large numbers of public sector employees to reduce the budget deficit may actually increase it in the long run by reducing tax revenues, increasing unemployment benefit payments, reducing demand in the economy (i.e sacked public sector workers will buy less goods and services as they won’t be able to afford what they need) and making private sector employees unemployed as the reduced demand means reduced sales for private firms. The Conservatives claim that large and immediate budget cuts are necessary in order to avoid a crisis like Greece’s, where a rise in interest rates demanded by creditors, combined with speculation by currency traders selling the euro, left the Greek government unable to pay the interest on its debts and the euro falling. Only a bail-out package from other EU members prevented this crisis spreading to the rest of the euro-zone countries. However Britain’s debt is only 53% of it’s GDP, compared to Greece’s debt of over 110% of it’s GDP, so Greece’s public debt relative to the output of its economy is more than twice as big as Britain’s relative to it’s economy. France and Germany both have government debts of over 70% of their GDP, while Italy's, like Greece's is over 110 of it's GDP. Osborne's claim in his budget statement that we have the highest deficit in the EU in absolute terms may be true, because we are the largest economy among those with a government deficit, but as a percentage of GDP it's not true. This is distinct from the annual deficits – the amount being added each year to the debt due to the gap between tax revenues and public spending, – at a bit over 13.6% of GDP in Greece’s case and 11.5% in the case of the UK – i.e the debt of the UK and Greece grew at a similar rate relative to the size of their economies over the last year. 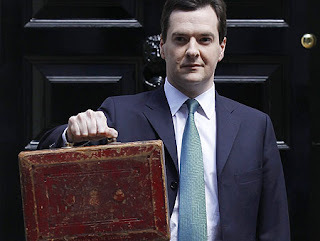 However Britain came out of recession this quarter for the first time since the financial crisis of 2008. Governments routinely rack up debts during recessions and by doing so get their economies out of recession, resulting in growth, increased revenues and so the ability to pay off some or all of their debt. What’s more, while there has certainly been a lot of wasteful spending and we did have a considerable public debt before the credit crisis, Britain’s debt is only as large as it is because of the financial crisis which was caused by a combination of deregulation of the financial sector on both sides of the Atlantic by both ‘left’ and ‘right’ wing governments in the UK and liberals and conservatives in the US. A ‘third way’ plan by the Clinton administration to make banks and other lending companies give mortgages to people who couldn’t afford to re-pay them also played a role. This was an alternative to building more public housing, which was seen as unacceptably anti-market or socialist. The British government bailed out the banks for hundreds of billions, took on their debts and suffered reduced tax revenues due to the recession caused by the financial crisis. While they were partly to blame for deregulating banking there was no criticism of deregulation of banking from the Conservative party in the 1990s – they supported it right up the financial crisis. Of course if it’s possible we should gradually eliminate our annual deficit and start reducing our total amount of debt and annual interest payments on it. It certainly doesn’t make sense to be paying interest on debt for decades if it’s avoidable; and we don't want a continuing deficit leading to ever larger debts and interest payments on them. However there are lots of ways we could do that without hurting the poorest or in fact anyone but the very richest. Bringing our troops home from Afghanistan would save a lot of money and a lot of lives. Scrapping or renegotiating private finance initiatives or ‘public private partnerships’ would reduce massive annual costs that aren’t even put on the books, due to an accounting fiddle. Ending public subsidies to privatised rail companies would save even more. If they really are investing in the railways, let them do it from the profits from their fares, which have risen at well above the rate of inflation. Ending export credit guarantees for arms companies like British aerospace would also save money, as would ending military aid to governments which are either dictatorships or whose governments and militaries are involved in the drug trades and death squads (e.g Colombia). Building more council housing would also reduce the government’s annual housing benefit costs, as maintaining a council house is much cheaper than the rents paid to many private landlords. Cracking down on tax evasion and tax avoidance by international co-operation with the EU and the OECD to close down tax havens (and even cracking down ourselves on the Channel Islands and the Bahamas) would bring in far more revenues than cracking down on benefit fraud ever has. Given all that putting caps – and very low caps – on housing benefit, seems downright mean, unfair; like the increase in VAT which is paid at the same rate by everyone, whatever their income. There are a few fair and progressive elements in the budget – like raising the level of income at which people pay any income tax at all, taking 900,000 of the lowest earners out of tax; and making big cuts in the corporation tax paid by small firms. Unfortunately the housing benefit cap and the VAT rise more than cancel them out. We’re also developing another problem – that maintaining an environment that humans can survive in reasonably well is not possible in an economic system which demands maximum profit in the short term from every company – and constant, infinite economic growth. Hamas’ refusal to recognise Israel’s right to exist is the number one reason given for the refusal of the Israeli government and it’s allies to negotiate with the Hamas government which Palestinians in the West Bank and Gaza elected in January 2006. This claim is based on Hamas’ founding charter, which, as Palestinian scholar Khaled Hroub has pointed out, was written decades ago and does not reflect Hamas’ current positions (1). It also makes the Charter of the Israeli Likud party, whose leader Benjamin Netanyahu is now Israeli Prime Minister, interesting reading. Strangely Likud's charter has not led to any other governments refusing to recognise the Israeli government until it changes it to recognise the right of a Palestinian state to exist, nor any sanctions being placed on Israelis for electing Likud. Likud’s charter is much more blunt than most Israeli political statements on a Palestinian state are, but doesn’t differ greatly even from the Oslo agreement offered by Yitzakh Rabin’s Labor government in 1993 , which involved a Palestinian Authority in which Israeli forces could summarily arrest any Palestinian, but no Israeli could be arrested by Palestinian forces no matter what they had done. The West Bank and Gaza would continue to be occupied by Israeli forces. Israeli settlements and Israeli military posts would continue to separate Palestinian enclaves from each other. The best West Bank land and water would be reserved for Israeli settlers. This is largely still the situation today, although Israeli governments have broken even the modest commitments they made under the Oslo agreements by continuing to annexe more land by force and build more settlements. The Gaza settlements were given up by Sharon under pressure from Bush, who wanted an apparent peace-making success to distract from his massive unpopularity in polls in the US due to Iraq and Enron, but Gaza remains under constant siege and regular military assault by Israeli forces. In return for the withdrawal from Gaza, the US gave Israel a free hand to annexe more of the West Bank (3) – (4). Prime Minister Netanyahu has talked of a Palestinian “state” since, but each time makes clear that in fact he would not allow a state that was a state in anything but name. It would not have it’s own military or control of it’s own borders or airspace. Since the US and Israeli governments continue to demand Hamas sign up to “existing peace agreements” – i.e Oslo - Israeli forces would also be able to enter this Palestinian “state” at will and arrest anyone they liked at will and be beyond the control of this “state”’s courts. Meanwhile the Israeli government continues to expand settlements and annexe land in the West Bank, in breach of Oslo (5) – (8). 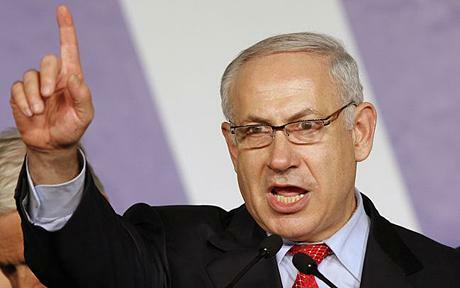 Netanyahu’s calls for negotiations to begin were with Fatah only, not Hamas. Since Hamas won legislative elections in 2006and the only elected Palestinian Prime Minister is the leader of Hamas, this is a bit like offering to negotiate with a US President who’s a Democrat but refusing to accept the US congress’ inevitable (and constitutional) involvement in the process because the Republicans won control of congress in the last elections. President Abbas of Fatah cannot make agreements without parliamentary approval under the Palestinian constitution – and if he does, they won’t hold. Fatah rejected this deal as categorically as Hamas did. Israeli historian Avi Shlaim points out that “The problem with Israel's concept of security is that it denies even the most elementary security to the other community.” – i.e the Palestinians (9) – (10). There has never been an Israeli government which recognised the right of a Palestinian state to exist, making it more than a bit hypocritical for them to demand that Palestinian negotiators accept Israel’s right to exist before negotiations begin. It also seems unlikely that they would accept recognition of an Israeli state which would not be allowed it’s own military or control of it’s own borders, would not have legal sovereignty over crimes committed in it’s territory ; and would have to allow Palestinian forces and settlers the right to control large parts of it and arrest Israelis under military laws. Yet this is what they demand Palestinian negotiators, including Hamas, accept, before negotiations even begin, when they demand recognition of Israel’s right to exist and that Hamas accept the terms of the Oslo agreement before negotiations can begin. Despite Israeli government propaganda about rational, secular Israelis facing crazy fundamentalist Hamas the view that God gave Israelis Israel, including the West Bank and Hamas, is mainstream in Israeli politics. The use of the biblical term “Judea and Samaria” for the West Bank in Likud’s charter is one example. Netanyahu in his speech said Israelis’ right to the land – including the West Bank - was based on the presence of Abraham and others there 3,500 years before. It was also used in briefings by Israeli intelligence to the cabinet under the “centrist” Kadima and “left-wing” Labor party coalition government during Operation Cast Lead. Even some Israeli military judges, who oversee military law applied to Palestinians living under Israeli occupation in the West Bank, have used the same language on the land having been given to the Jewish people by God (11). Ehud Barak, the Labor Defence Minister during Operation Cast Lead remains Defence Minister under Netanyahu in coalition with Likud. Unlike Likud in 2009, with it’s platform of preventing a Palestinian state, Hamas in 2006 did not campaign on a platform of destroying Israel. If they had campaigned on a platform of destroying Israel, Palestinians would have laughed at them. How could a few thousand militants with automatic weapons and home made rockets destroy the Israeli military with its thousands of state of the art tanks, aircraft, helicopters, artillery pieces and drones? It’s not true that Hamas have refused to negotiate either. Hamas leaders including Khaled Meshal and elected Palestinian Prime Minister Ismail Haniyeh repeatedly offered negotiations with Israel; initially on condition it withdrew from the territory it annexed in the 1967 war and since, later without pre-conditions. They’ve also stated they accept any Palestinian state would have to exist alongside Israel (12) – (18). This ended after Israel’s ‘Cast Lead’ offensive on Gaza in December 2008 to January 2009, in which around 1,400 Palestinians were killed, at least half civilians, many reported by Amnesty International to have been killed in war crimes, turning Palestinian public opinion against any deal with Israel (19) – (20). The Israeli foreign ministry website shows the number of Israeli civilians killed by the rocket fire which was meant to be the reason for the Israeli offensive in the six months before ‘Operation Cast Lead’ began. One. It also shows that within a few weeks of the operation beginning , three Israeli civilians had been killed by rocket attacks (21). That does not make the rocket fire or the killing of three civilians by Palestinian terrorist groups justified, but it does show that the Israeli offensive must have had some motive other than just stopping rocket fire, much of which was by factions other than Hamas. It should come as no surprise that when you kill lots of the other sides’ civilians, more of them want revenge on you and kill more of yours. The mindset that thinks you can always bomb any opponents into submission forgets that September 11th and July 7th did not make Americans or British foreign policy less extreme – so bombing Palestinians, Afghans or Iraqis is not going to make their politics less extreme or less violent towards us either. They are not some alien race, but humans who suffer much like us – and react similarly to us when attacked, with a minority calling for restraint and a majority for revenge on someone, anyone. The Israeli government’s refusal to negotiate with Hamas even after it’s election victory led to Hamas’ political wing losing influence over some of it’s military wing – the Qassam Brigades. Factions other than Hamas were even harder for Hamas’ political leaders to control – and the Israeli offensive aimed at destroying Hamas’ ability to govern Gaza – for instance targeting police stations and police - while simultaneously holding Hamas responsible for every rocket fired out of Gaza. Former heads of Mossad and Israel’s Shin Bet military intelligence have called for negotiations with Hamas without preconditions, along with former Israeli foreign minister Shlomo Ben Ami and many others. 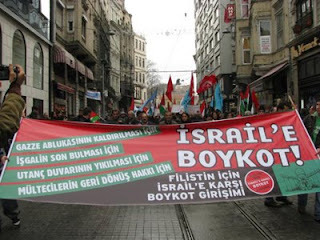 Will the Gaza blockade cause a US and Israeli backed military coup attempt in Turkey? The Israeli attack on the Gaza aid flotilla led to a temporary lifting of the blockade on Gaza by Mubarak’s dictatorship in Egypt and an Israeli government statement on an easing of the blockade on land, but also reports in the Turkish and Indian media that Turkish government ministers have suggested future aid flotillas to Gaza may be escorted by Turkish navy warships (1) – (2). The Turkish government statements will have created a potential head-ache for the Obama administration in attempting to keep Turkey and Israel from ending up at war after Israeli forces already committed an act of war by attacking Turkish flagged civilian ships in international waters and killing Turkish citizens. 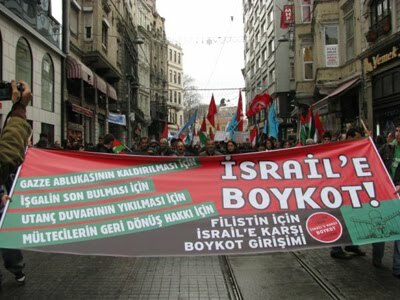 The tension between Turkey and Israel is another shift in Turkish foreign policy, like the Turkish government’s refusal to allow US troops to go through it’s territory to invade Iraq in 2003. The shift in Turkish foreign policy is the result of democracy in Turkey, a country with a Muslim majority. Historically Turkey has been a close ally of Israel because Turkey was either ruled by extreme secular nationalist military dictatorships, or had elected governments so afraid of another coup that they were unwilling to do anything which might offend the US-aligned military. While there has been a lot of scaremongering about an Islamic party having been elected to government in Turkey it is not significantly more extreme than Christian Democrat governments in western Europe have been, while many of the “secular nationalists” praised by non-Turks with an excessive fear of all Muslims are nationalist generals so extreme as to be pretty much fascists. The fact that the foreign policy of Turkey’s elected government is beginning to cause friction with the US and Israel is likely to lead to Israeli and American intelligence operatives being directed to support a military coup in Turkey. Dozens of suspected members of a Turkish ultra-nationalist organisation – ergenekon – including generals- are already being tried in Turkey on charges of planning a military coup (3). This is not that surprising given that Hamas, too, were democratically elected by Palestinians in both the West Bank and Gaza in legislative elections in January 2006. Rather than recognise this fact, affirmed by EU election observers at the time, the US and Israeli governments and the dictatorship of Hosni Mubarak in Egypt attempted to back a military coup by Fatah’s armed wing against Hamas. They have also refused to recognise or negotiate with Ismail Haniyeh, the elected Palestinian Prime Minister; instead choosing to recognise President Mahmoud Abbas of Fatah, who was also elected, but has appointed his own Prime Minister and cabinet – something he has no authority to do under the Palestinian Authority’s constitution (Abbas’ appointee as ‘Prime Minister’ is Salaam Fayad). Whether I, or the majority of Israelis, Europeans or Americans disagree with Hamas’ brand of Islamic fundamentalism is irrelevant. Hamas were democratically elected by Palestinians and no-one else has the right to tell them the government they voted for is forbidden. Nor are Hamas particularly worse than the major Israeli political parties, all involved in war crimes, or Fatah, whose armed wing is deeply involved in terrorism as much as Hamas’ is. Turkey’s government will be well aware that they face increased risk of a military coup. They arrested many members of the military accused of being members of ergenekon – an ultra-nationalist group plotting a military coup, but Turkish public opinion and their own inclinations have led them to demand that NATO condemn the Israeli attack on Turkish flagged ships. The Obama administration refused, just as they refused to allow the word “attack” to be included in the UN security council resolutions on the issue. If it seems far fetched that the US would back a coup in a fellow NATO member country consider the respective strengths of the Israeli and Turkish lobbies in the US – and the US backed military coups in Greece in 1967 and Honduras in 2009, again involving ultra-nationalists and fascists. The whole point of these coups is to make sure that US allies continue to follow domestic and foreign policies acceptable to Washington. What happens next could be as important to relations between the Muslim and non-Muslim world as the crusades or the fall of Constantinople. The failure of the military coup attempt against Hamas (at least in Gaza) and the failure of the blockade should give everyone pause for thought. No-one with any sanity or humanity should want to risk destroying democracy in Turkey – and to do so would be a gift to Al Qa’ida; more apparent evidence that the US and the EU will not allow democracy in predominantly Muslim countries. The Israeli military’s attack on ships carrying aid to Gaza makes Somali pirates look like saints by comparison. Somali pirates come from one of the poorest countries on earth, take hostages for money and it’s unknown for them to kill them. Israeli forces, from one of the richest countries in the world, killed at least ten people to prevent them bringing food and medicines to people short of both. Israeli military claims that they were attacked first with iron bars, knives, axes and gun-fire are contradicted by Turkish television videos which seem to show only fists and pieces of wood being used to resist boarding, though neither this video nor Israeli military ones are all that clear (1), (2). 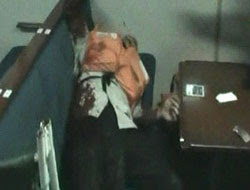 A journalist on board one of the ships also reported that Israeli forces opened fire on the ship he was on before they even boarded it, casting further doubt on IDF claims, which are probably more propaganda, like their past claims that UN ambulances which they fired on were carrying Qassam rockets; which turned out to be stretchers (3) – (5). The military assault on unarmed civilians and vessels sailing under the Greek and Turkish flags in international waters is a serious breach of both international law and Greek and Turkish sovereignty and will probably lead to a deterioration in Turkish-Israeli trade deals and intelligence co-operation. As Craig Murray, an expert on maritime law from his time in the British foreign office, points out, in terms of international law Israeli forces have invaded Turkish territory and may have killed civilians who are Turkish nationals, which is both an act of war and a war crime. The Israeli government and military stories have varied from claiming that Israeli forces were fired on with guns before they returned fire, to claims that people on board the ship stole the side-arms of Israelis who had boarded and began firing on them. One Israeli cabinet minister then told the BBC’s News 24 that the Israeli commandos who boarded the ships were only armed with paintball guns. An Israeli military source told the Israeli newspaper Haaretz marines had both paintball guns and lethal pistols, while an Israeli commando told them “They jumped me, hit me with clubs and bottles and stole my rifle...I pulled out my pistol and had no choice but to shoot.” (6). Which version of events is accurate is hard to say. What is obvious is that the various Israeli claims are not consistent with each other – and that the Turkish TV video shows Israeli soldiers with rifles, helmets and body armour fighting with people armed with some kind of bars, sticks or clubs (7). What’s also certain is that Israeli forces are holding around 600 of the surviving passengers from the ships prisoner and preventing the media from talking to any of them before they’re deported –all are in jail without trial, potentially indefinitely, under military law, suggesting Israeli forces have something to hide here and may be trying to throw out enough random claims to conceal the truth, while preventing the media getting to talk to most (non-Israeli military) eye-witnesses (8) – (11). Like the Israeli military’s repeated attacks on UN aid trucks and clearly marked UN buildings during the Gaza war in late 2008 to early 2009, this latest atrocity highlights how wrong the blockade, which denies all the people of Gaza enough food, fuel and medical supplies, is. Fuel is blockaded on the grounds that it can be used to make rockets, yet there is no blockade on fuel or ammunition from the US and Europe to Israeli tanks, helicopters, aircraft or artillery, which kill around 10 times as many civilians each year as are killed by all attacks by Palestinian groups on Israeli civilians combined . Israel’s “Gaza War” or “Operation Cast Lead” alone killed around 1,400 Palestinians, the majority civilians, in three weeks. The killings included indiscriminate bombing and artillery fire, deliberate targeting of UN vehicles, buildings and staff ; and many incidents of Israeli troops on the ground shooting unarmed men, women and children carrying white flags (12), (13). .It’s not only the Israeli government which was responsible for establishing the blockade of Gaza but also “the Quartet” – the EU, the UN, Russia and the US. So the British government are involved in this blockade too, though they, the EU and the UN have since called for the blockade to be lifted ; mostly as a result of the media coverage generated by volunteers organising aid convoys like the flotilla to Gaza. The supposedly “moderate” dictatorship of President Mubarak in Egypt has been Israel’s partner in the blockade, closing Gaza’s borders with Egypt. The Israeli government argue that they allow some food and medicines into Gaza. This is true, but the UN say the amounts allowed in are around a quarter of what the population requires (14). Anyone who’s read Primo Levi’s account of his time in Auschwitz concentration camp will know that during the Holocaust the Jewish prisoners were allowed some food too, just not nearly enough (15). The World Health Organisation had already found by April of last year that the blockade of Gaza, which began in January 2006, was causing rapidly increasing rates of malnutrition among children in Gaza and resultant increases in anaemia due to protein deficiency and stunted growth (16). Gaza today is a giant concentration camp with the whole population imprisoned and punished by the Israeli military and government. Israeli forces don’t systematically exterminate the people of Gaza with poison gas, so it’s not as bad as Auschwitz was. They do however routinely indiscriminately bomb and shell Gaza, killing civilians and destroying thousands of houses and hundreds of factories – including flour mills and cement factories in the last Gaza “war” (which was more of a one-sided massacre by Israeli forces) – and they have even often randomly shot Palestinian civilians, including many children, in the head with sniper rifles, on the orders of superiors. They also ensure the entire population are short of food and medicine (17), (18). The Gaza flotilla embarrassed the Israeli government by highlighting the blockade – and was punished for it. Israeli deputy Prime Minister Danny Ayalon called it “an armada of hate” which was guilty of “provocation” and attempting to “delegitimise Israel”, while the deputy Speaker of the Israeli Knesset (parliament) claimed that most of those on board the ships were “terrorists” (19). The blockade also prevents such “terrorist” items as cement, shoes, clothes and crayons entering Gaza most of the time (21). The Gaza flotilla wanted to ensure these kind of items reached Gaza. The Israeli government claims it wanted to ensure no arms were reaching Hamas, but it’s clear the blockade goes far beyond preventing arms into Gaza and aims to overthrow the elected government entirely by a long running siege combining restricted supplies with periodic bombing and ground raids. The bravery of the people on board it has opened at least a temporary lifting of the blockade, with Egypt having opened it’s border with Gaza for food and medical supplies and to allow those needing medical treatment to leave. So Gaza is somewhere between the original “concentration camps” in which millions of black South Africans and Dutch boer colonists were held and left to starve by the British in the 19th century; and the Warsaw ghetto uprising during the second world war when many Poles, including Jews, tried to fight off the occupying German forces; except, that it’s in slow motion – the ghetto is not destroyed in weeks but over decades. Hamas won the January 2006 Palestinian legislative elections and offered negotiations with Israel, at first with the precondition of Israel withdrawing back to it’s pre-1967 war borders; then later without preconditions. The Israeli government refused, placed pointless preconditions on negotiations; and had sanctions imposed on the West Bank and Gaza. The Israeli government has never recognised the right of a sovereign, independent Palestinian state to exist alongside it – and annexes more Palestinian land every month. Israelis including Professor Yossi Alpher and former Israeli Foreign Minister Shlomo Ben Ami point out these preconditions were not placed on past, successful, peace negotiations with Jordan or Egypt – and call for the preconditions on negotiations to be dropped (25), (26). The former heads of Mossad and Shin Bet (Israeli intelligence and military intelligence) Efraim Halevy and Shlomo Gazit, have also called for negotiations with Hamas. Gazit called the Israeli government’s preconditions “ridiculous, or an excuse not to negotiate” (27), (28). A poll in March 2008 showed 72% of Israelis wanted negotiations with Hamas (29). Instead of negotiating the Egyptian, Israeli and US governmentsco-operated to arm and train the armed wing of Hamas’ rival Fatah. Fatah is the largest party in the PLO and was formerly headed by Yasser Arafat and now headed by Mahmoud Abbas. In 2007 Fatah, desperate to escape sanctions imposed by Israel and the Quartet on both the West Bank and Gaza at the time; and encouraged to fight Hamas by the Israeli and US governments , attempted to overthrow Hamas by force. They succeeded in the West Bank, but failed in Gaza. Both sides, Hamas and Fatah, then began murdering anyone suspected of supporting the other party, armed or unarmed, civilian or combatant, in the territory they held. (This episode is generally misleadingly described in the Western media as Hamas “seizing power by force in Gaza”, probably because that’s how our governments’ press officers have briefed them to say it in order to avoid embarrassment to their allies in the Israeli government). The sanctions on the West Bank were then lifted (though occupation and settlement there continues), but those on Gaza remain. Mahmoud Abbas of Fatah is certainly the democratically elected Palestinian, but Ismael Haniyeh of Hamas is equally the democratically elected Palestinian Prime Minister – and Abbas has gone far beyond the powers granted to the President under the Palestinian constitution.. For instance he’s appointed his own Prime Minister and cabinet. Under the Palestinian constitution he has no power to do so ; only parliament does – and Hamas won a a majority in parliament. Don’t be fooled by Israeli propaganda about “peace” in the West Bank, where Fatah is now in control, either. The occupation continues there, with more Palestinian homes bull-dozed and more Palestinians killed by settlers and Israeli soldiers every week. Children and teenagers throwing stones at Israeli watch towers are still shot dead with live ammunition in “self-defence” by Israeli troops in the West Bank the same way the civilians on board the Gaza flotilla were shot. So are Palestinian demonstrators in the West Bank, protesting against the bombing of Gaza or the annexation of their farmland, or for an end to the civil war between Fatah and Hamas. Some are entirely peaceful, others are throwing stones at Israeli watch towers, armoured vehicles or troops in body armour with helmets. The stones are always described as “rocks” in Israeli military versions of events, though it’s unlikely that 9 year olds or 14 year old Palestinian boys could throw stones large enough to qualify as “rocks” before they’re shot. Even Palestinians who are just going about their work on their farms or walking home are often shot. (Israeli Arabs demonstrating against the Gaza war got similar treatment from Israeli police, much like Israeli Arab protesters (and bystanders) during the Intifada in 2000 – many have already been arrested for protesting against the attack on the Gaza flotilla) (30) – (37). A new Israeli military directive in the West Bank will also allow Palestinians to be summarily deported, clearing the way for more settlers (38). While Israel’s government claims it has no room for Palestinian refugees driven out by Israeli forces in the 1947 and 1967 wars, or their descendants, it welcomes settlers from anywhere in the world who have one Jewish grandparent or a Jewish partner under a 1970 amendment to Israel’s “Law of Return” (39). While they’re still talking about ‘Judenrein’ areas the reality now is apartheid between Jews and Arabs much like South African Apartheid between blacks and whites in the past. Israeli governments, while condemning Hamas’ religious extremism, refer to the West Bank as ‘Judaea and Samaria’ – biblical names; and many Israelis – including high ranking former Military judges - believe this land was granted to the Jews by God (40) – (41). Israeli governments say they will not allow a government hostile to them to exist in Gaza or the West Bank. Where do they get the right to have a veto on who is democratically elected to government in another country? Their only claim to that right is by force of arms, which is no more legitimate than the Chinese “right” to occupy Tibet is now, or the German “right” to occupy Poland was in the Second World War. Israeli governments and politicians object that Hamas’ armed wing are terrorists, killing civilians on the orders of Hamas leaders. Yet Israeli military forces are also war criminals, killing ten times the number of civilians every year on the orders of the Israeli government. Palestinians were given no veto when Ariel Sharon, the architect of the Sabra and Shatila massacres, was elected Prime Minister of Israel and allowed to order new war crimes against Palestinian civilians. They did not get to starve all Israelis until they replaced this war criminal. Nor did they get support from other governments for getting rid of the Olmert government after the Gaza war crimes last year; nor are they likely to get it to replace the war criminal Benjamin Netanyahu, who ordered attacks with live ammunition on unarmed civilians on ships travelling to Gaza. There is only one solution to the Israeli-Palestinian “problem” and that is for the democratically elected war criminals to be forced to sit down with the democratically elected terrorists and negotiate a peace deal that creates either a viable Palestinian state; or else a single state with equal rights for Jewish and non-Jewish people, for Arabs and non-Arabs, for all to live as equals ; rather than the current system – an Israeli mixture of apartheid and occupation which can only produce more extremism and violence by both sides. Don’t expect much from the British or American governments unless they get a lot of hassle from their electorate about this though. The Obama administration merely said it was “concerned” and “regretted the loss of life”, while one of the new British government’s priorities, announced the day before the attack on the Gaza flotilla, is to change the law eliminate any chance that Israeli politicians involved in ordering the war crimes against civilians in Gaza in 2008 to 2009 might be arrested and made to stand trial for it if they visit Britain (42) – (43). Then Britain can be a safe haven for war criminals from all over the world - whether from the Israeli government, Hamas' armed wing, Afghan Taliban - whatever. Email your MP and ask them to speak out against the blockade of Gaza and the attack on the aid flotilla. and to demand the immediate release of all the people from the flotilla who are being held without trial in Israel. You can this through www.writetothem.com by typing in your postcode. Boycott Israeli produce – if it’s made or grown in Israel, don’t buy it. Write to newspapers condemning the attack on the convoy and the Israeli blockade of Gaza and call for the release of the 600 people held without trial by Israel. Newspapers vary in what length of letters they’ll publish, but most won’t publish letters longer than 200 words. They’re much more likely to publish letters on a particular topic if they get a lot of letters on that subject though.